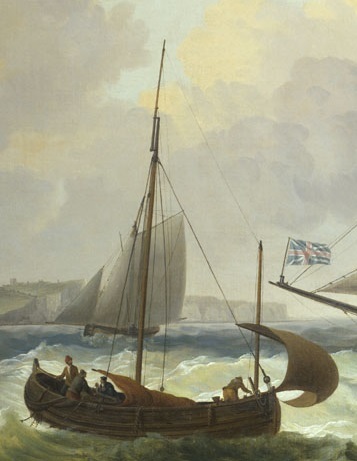 "A Ketch-Rigged Royal Yacht Close-Hauled on the Starboard Tack off Dover," Dominic Serres, c.1760, National Maritime Museum. Royal yachts are generally small vessels intended for use by a royal family. As the name "yacht" implies, these vessels generally sail in calm weather and shallow waters, but are manned by naval personnel. This example is squaresail ketch rigged. 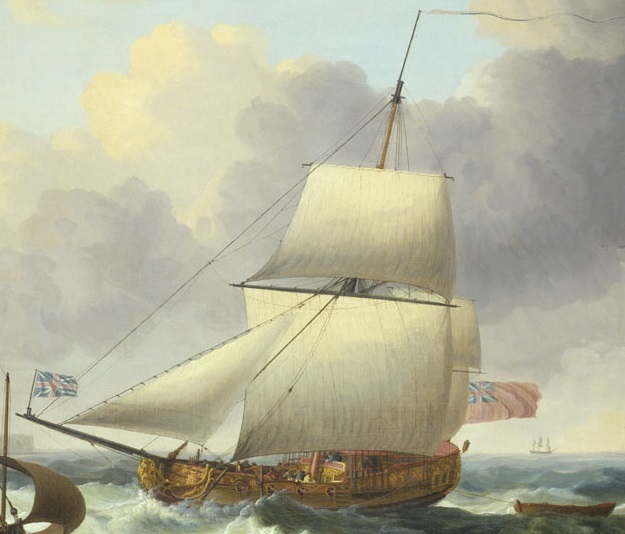 She has two masts, but differs from brigs, snows, and brigantines in that her forward mast is the main, and taller than the aftermost mast, which became her mizzen. 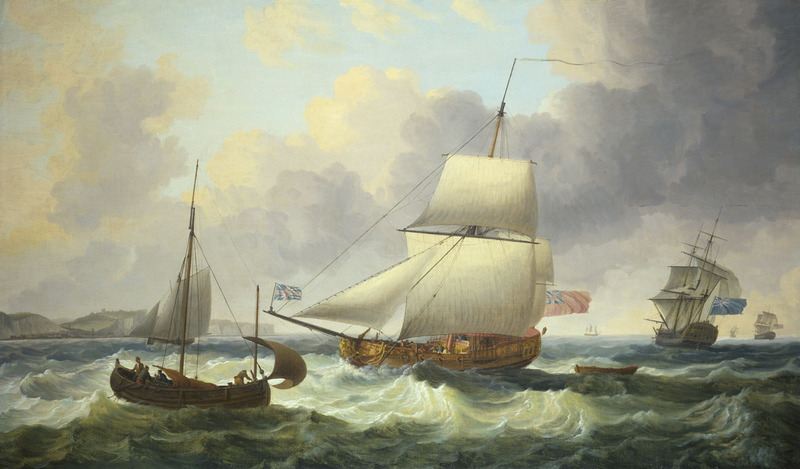 Another key difference is that her main and mizzen are crowded further astern, giving a spacious open area on her deck. The Royal Navy used ketch rigged vessels to carry mortars for lobbing bombs in a siege specifically because of this useful open deck space. Passing larboard to larboard of the yacht, a small vessel plows through the choppy sea. Her four man crew appear to be taking in the mainsail. They wear jackets that end just below the waist in various shades of brown, and one in blue. Their breeches are a bit more varied, with brown, red, and blue present. The coxswain wears a red knit cap, but the headwear of the other sailors is too difficult to make out. The crew of the yacht are even more difficult to make out. With an extreme zoom, we can see red, brown, grey, and blue jackets, and what appears to be one pair of white trousers, but nothing more significant can be said with this resolution.